When the recent incident of sectarian violence in Egypt broke, I was impressed by the neutrality of the British media in reporting the story; that is until I read the title of the article published in the in The Daily Telegraph on the 12th of October. 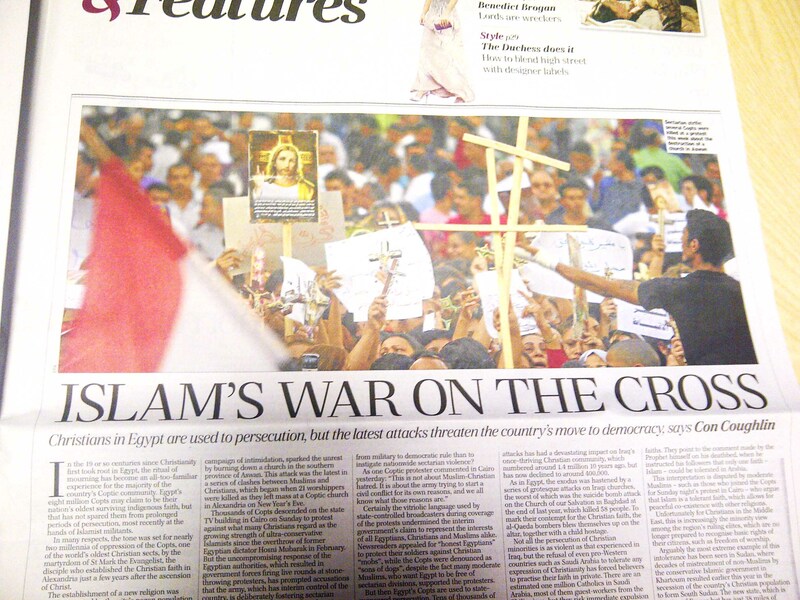 The headline: “Islam’s war on the Cross” was wrong on so many levels, as it declared a religious war. Coptic Christians went on a peaceful demonstration to protest against the burning of a church in Aswan, only to experience the unexpected. The army, which had acted as the “protector of the people” during the revolution; aggressively attacked the Coptic demonstrators leaving many injured and 26 killed. In Islam those who burn churches and kill innocent people have breached clear instructions from Prophet Mohammed peace be upon him. In war with enemy, Muslims are prohibited from killing women, children and elderly people, bombing civilian complexes and places of worship, and burning greenery. I find it Ironic when people break Islamic rules, they are labeled as Islamist when in reality they are sinners. As a Muslim, I am sick and tired of media blaming anything and every wrong act on Islam. There is the good and bad in every nationality, country, religious, and household. If someone does wrong, blame the person not the religion. This entry was posted in General, London, News by sousalz. Bookmark the permalink.